The Hong Kong seam finish is an exquisite seam finish. Being a person originally from Hong Kong, I am not aware how this name came to be. In fact, if you mention Hong Kong seam finish in Hong Kong, I bet everyone will stare at you like you are speaking gibberish. I imagine you’d probably receive a similar reaction when you ask French people about French toast. Hong Kong seam finish (“HK finish”) is not difficult. It is, however, time-consuming. But if you ever encounter a custom-made garment with HK finish inside, you can bet that it’s a well-made, high-quality piece of clothing. In my opinion, it’s absolutely worthwhile. In fact, I also use this same method to finish a raw edge that is not a seam, such as the edge of a facing or a pocket. In Part 2, we’ll go over HK finish on convex curves. First thing first—to make any HK finish, one has to has some bias tape. If you are finishing a jacket (like what I am doing here), you’d need A LOT of bias tape. I recommend making your own bias tape because the typical store-bought version is very thick (there are lightweight bias tape out there, but they are not easy to find). And of course, you can have it in whatever color or fabric pattern if you are making it. If you haven’t already, please go over this post on the continuous loop method of making bias tape. Be sure to choose a very lightweight, yet stable, fabric such as cotton lawn or batiste. The width of your bias tape should be four times the finish width. For example, if I want my finished width to be 1/4″ (6 mm), then the width of my bias tape should be 1″ (2.5 cm). Also, I’d like to mention that HK finish is actually quite similar to bias bound seam that was posted before. I think HK finish is slightly easier. But you can be the judge; try both and let me know which one you like best. You should already have a seam that is pressed opened. My seam allowance on this sleeve is 1/2″ (1.25 cm). I plan to have my finished HK finish to be 1/4″ (6 mm); hence, my bias tape is 1″ (2.5 cm) wide. With right sides together, pin the bias tape to the raw edge. Here I am pinning it to the left seam allowance (though it looks like I am covering both seam allowance; that’s only because the bias tape happens to be the same width, but it doesn’t have to be). Go ahead and trim the excess bias tape off; we only need it as long as the seam we are finishing. Stitch them together with a 1/4″ (6 mm) seam allowance (the same as your finished width). Wrap the bias tape over the raw edge. There you have it. Isn’t it simple? And this is how the flip side look like. Yes, there is a raw edge, but because it’s tucked under and is on bias, it won’t fray. You could also trim the bias tape close to the stitch line if you’d like. Repeat for the other raw edge and you are done with this one seam. What if you have a corner that you need to go over? I actually prefer to do two separate bias tape instead one continuous one. Let me show you what I mean. I finish one edge as demonstrated above. Now I want to finish the top raw edge too. So I pin a bias tape to it, right sides together. Stitch with a 1/4″ (6 mm) seam allowance. I turn the bias tape up as if I am about to wrap the raw edge again. But before I wrap it all the away, I fold the hanging bit in too. This shows the hanging bit folded behind nicely. With that taken care of, I can continue to wrap the rest over the raw edge. Pin the bias tape in place. Now I can stitch in the ditch. And this is what the back side looks like. That’s all! Note that I don’t worry about the other edge in because that side will be sewn into a seam. So you do have to think a little ahead of time to see what side is being sewn into the seam, and you only finish the raw edges that would be exposed. Finally, let’s take a look at the armhole. But actually when I say armhole, I really mean any circular seam. Besides the armhole, you can also use this same method on the sleeve hem, or even on the garment hem if there’s no closure (i.e., one continuous “loop”). First, pin the bias tape right sides together with the edge you want to finish. For the short end of the bias tape, fold a little bit in like in this photo. Then continue to pin the bias tape along. Lay the end on top of the beginning of the bias tape. Cut the excess bias tape off. Stitch through all layers with a 1/4″ (6 mm) seam allowance. Now you can wrap it over just like we did before. And stitch in the ditch. You are done! You probably notice that one side of the finish has the raw edge of bias tape, correct? Because of that, you need to think about which direction you will be pressing your seam allowance. In my case, I am pressing it toward the sleeve (I almost always do), then the “clean” side of the HK finish should be the bodice side (so the raw edge is tucked under). It does require some prior thinking! Check out Part 2 now. Hope this is helpful! Until next time, keep stitching! Ah… French toast in France is called “pain perdu”, which literally means “lost bread” as we make it to use up stale bread so not to lose it (throwing it away). French seams are called “coutures anglaises” in French (English seams). Which, for a bilingual like me, was a bit confusing at first. I had never heard of this practice by the Hong Kong finish. I was raised it was called French seams. Anyway it is very nice way to finish your seams, but I would like to say if u do not have the time or extra bias, serger cuts down the time and material. But very interest article. Hi Connie, this most certainly is not French seam. You can read about French seam here: https://itch-to-stitch.com/sew-french-seams/. Yes, serger is faster for sure. Hong Kong seam finish is for something special. 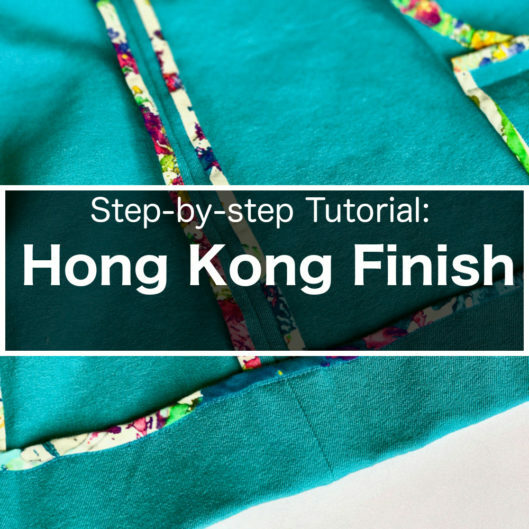 The term Hong Kong seams, originates (I believe) from the Hong Kong tailors’ reputation for high quality garment finishes.